Present state: The site is now owned by the Forestry Commission. The platform and building survive; the building, with some alterations, is in residential and office use. The signal box on the platform and the goods dock to the south of the station are also extant. A new building has been added between the booking office and the signal box with an extension to the signal box at the rear. 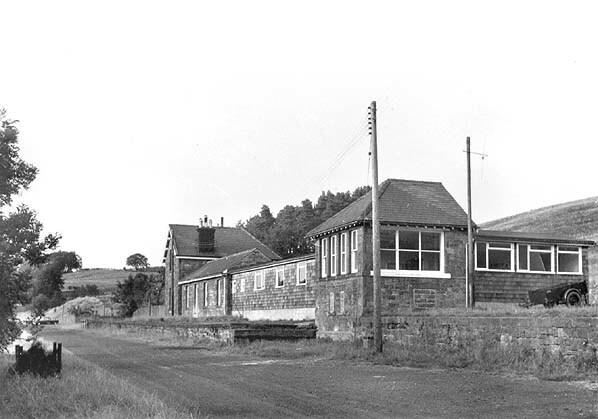 Notes: Falstone has, since the 1930s, been on the edge of Kielder Forest. 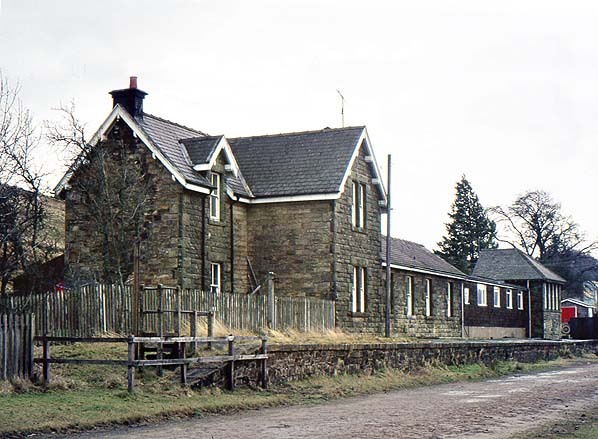 The station was a temporary terminus, in 1861-62, as the Border Counties Railway pushed from Hexham towards Riccarton Junction. 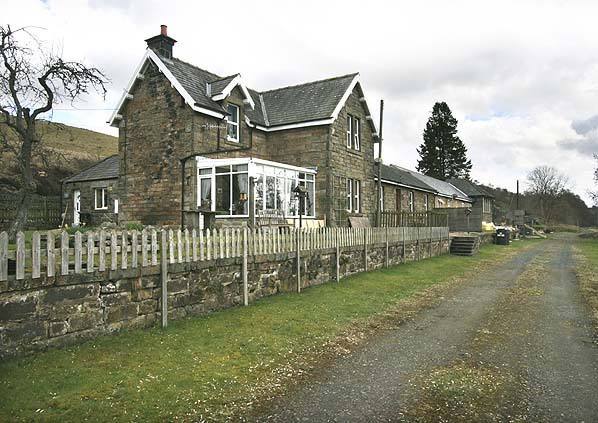 The platform on the up side, extended to 85yd, had a two-storey L-plan house with corbelled gables. A single-storey section extended south. A siding, with goods dock, was set into the south end of the platform, and a loop faced the platform with a further siding at the north end of the station. A signal box was sited on the platform. Just north of Falstone Station a siding linked to an inclined tramway to Hawkhope Hill Colliery. 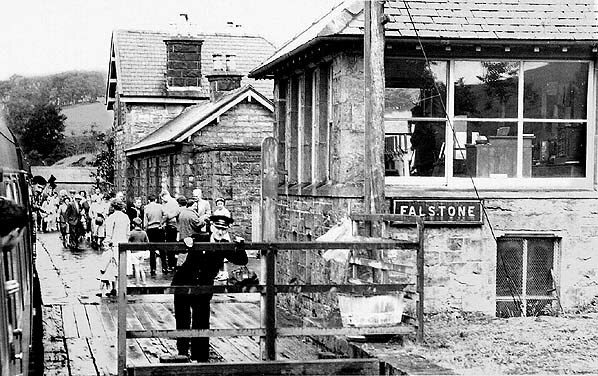 Falstone closed to passenger traffic on 15th October 1956 but remained open for goods until 1st September 1958. Enough land along the Border Counties line was bought for double track, and major masonry structures (except Border Counties Bridge) were built to double track dimensions and of excellent quality. However a single track sufficed. 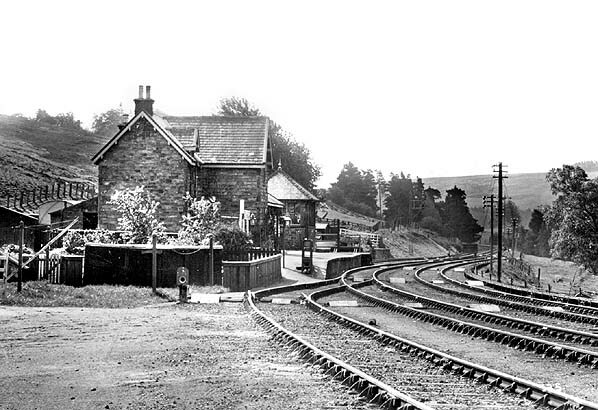 The line rose from about 120ft at Hexham to about 870ft approaching Riccarton, with a ruling gradient of 1 in 100. The difficult terrain required numerous curves and earthworks, and several viaducts. Border Counties Bridge, immediately north of Border Counties Junction, and east of the confluence of the rivers North and South Tyne, had four spans over the river, the wrought-iron girders carried 15ft above water level on cast-iron tubular piers, and smaller spans on the north bank. This bridge was subject to severe erosion, partly offset by the provision of cutwaters. Following the August 1948 floods, the southern span needed strengthening with timber props. After closure the piers and girders were removed. At Reedsmouth the five skew-arch Rede Bridge was of stone and 30ft high. Only the piers survive today. Kielder Viaduct was the line’s finest structure, 130yd long and 55ft high, and decorated with battlements to complement Kielder Castle. The design was remarkably complex. The skew-arches incorporated a system devised by Peter Nicholson, a Newcastle geometrician, whereby each stone was individually shaped. The viaduct is designated an Ancient Monument. A five-span viaduct (now demolished) crossed Dawstonburn, near Saughtree. Smaller skew-arch viaducts survive at Chollerford and Tarset.